Enjoy the cool and delicious taste of the purest water straight from the kitchen tap with the Grohe Blue Home Duo starter kit. Offering chilled or carbonated still, medium or sparkling water the choice is yours. The stylish single lever tap has been designed to look stunning in any kitchen with its durable Grohe StarLight chrome coating and easy to use single lever. The cooler unit is slim and adaptable and is compact enough to be fitted directly below the sink or in a 30cm wide cabinet within a radius of 4.5 meters. 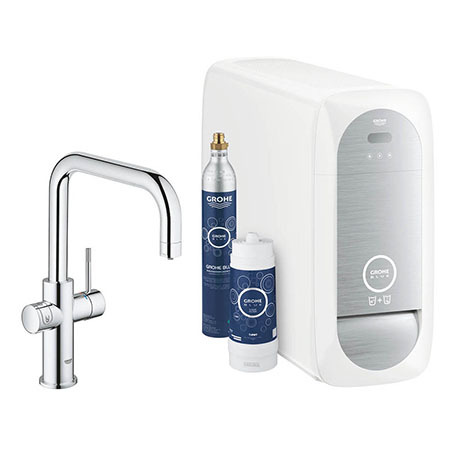 Changing the CO2 bottle and filter is quick and easy, when the times comes to replace them the display on the tap will alert you with a flashing light. There are three timeless and elegant options in the Grohe Blue Home range: the L, C and U-shaped spouts, available in two stylish finishes - chrome and stainless steel.